Big Finish’s decision to reunite Ace and Mel for further adventures alongside the Seventh Doctor following their only appearance together in 1987’s ‘Dragonfire’ instantly brought with it the intriguing prospect of offering stories steeped in late 1980s nostalgia that also promised a new and exciting dynamic all of their own. As the trio crosses a mysterious threshold and finds a strange alien landscape with an army of tortured souls and a warlord fighting to prolong his life no matter the cost, Mark Morris’s ‘The Dispossessed’ is the latest tale to tackle this dynamic, and the Doctor soon finds himself forced to decide whether to save his companions or himself. ‘The Dispossessed’ is something of a strange release both in terms of tone and story. The early televised McCoy tales occasionally emphasised humour a bit too much even in more serious situations, and this story likewise finds itself trapped and unable to fully commit to the true horror of its central ideas to provide the engrossingly dark and psychological tale that lurks just beneath its surface. Despite that tonal mishmash, though, Sylvester McCoy gives a wonderful performance pitched somewhere between the more comedically-inclined post-regeneration Doctor he began as and the conniving manipulator he would become, and it’s unexpectedly the humour stemming from Stirling Gallacher’s alien being who has taken on the form and novel vocal stylings of Isobel that provides the most memorable portion of this release. Again, this voice perhaps adds a bit too much levity to what becomes a soldier’s harrowing search to bring a despicable war criminal to justice, but Isobel and her robotic sidekick are indisputably entertaining. As the story’s beginning quickly jumps between spaceship and tenement, Morris creates multiple interesting storylines that initially seem wholly distinct despite the inevitable link that is eventually revealed, and the use of a weapon that destroys billions parallels nicely with the more sobering story of Ruck and Jan who have taken refuge in this desolate building to hide away from Jan’s ex and who suddenly experience an explosion that cuts power to the building and seemingly takes away the daylight outside as well. With the few remaining tenants changing one by one into mindless zombie-like beings who can voice nothing but their perpetual feeling of hunger, the suave Arkallax slowly reveals his true megalomaniacal colours as the powers, consequences, and limits of his mental capabilities become known and pit him squarely against the Doctor while Ruck discovers a shocking truth about just why he has not succumbed to the same fate as his peers. 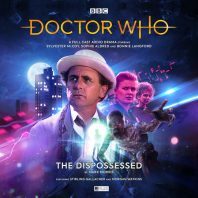 ‘The Dispossessed’ does feature fairly strong guest performances throughout, and Morgan Watkins and Anna Mitcham encapsulate the needed bravery to overcome their characters’ natural fear to help the Doctor while Nick Ellsworth imbues Arkallax with a strong menace and ego. The Seventh Doctor is the master manipulator, of course, but his ability here to hide just how powerful his own mental prowess is to emerge victorious doesn’t come close to holding up to some of the more complex and emotional schemes he has put into motion both on television and under Big Finish’s tutelage. Through no fault of McCoy, this sequence of events with the Doctor battling Arkallax doesn’t quite fully resonate as a result, meaning that a story that tries to create an oppressive and horrific atmosphere throughout and that gives Sophie Aldred and Bonnie Langford plenty of scenes together to spotlight Ace and Mel can’t capitalize on its bevy of strong ideas. Instead, ‘The Dispossessed’ is somewhat disjointed and a bit too rushed in its explanations after taking its time with an intriguing setup, not giving its leads the strongest material and fighting to balance a lighter score with the darker themes, and it never quite manages to find a steady tone to provide the needed glue for the pieces of this ambitious story that are on display to result in a strictly average affair overall that reduces its scary premise to naught but technobabble.